A PLAN of BOSTON and CHARLESTOWN; from a Drawing Made in 1771. [and, on the same sheet:] An Accurate Map of the Country round BOSTON in NEW ENGLAND from the Best Authorities. London: A. Hamilton, January 16, 1776. Two maps engraved on a single sheet of laid paper, together 12 5/8”h x 16 3/8”w at neat line plus narrow margins, uncolored. Very minor soiling, diagonal crease at lower-left corner, trimmed close all around. 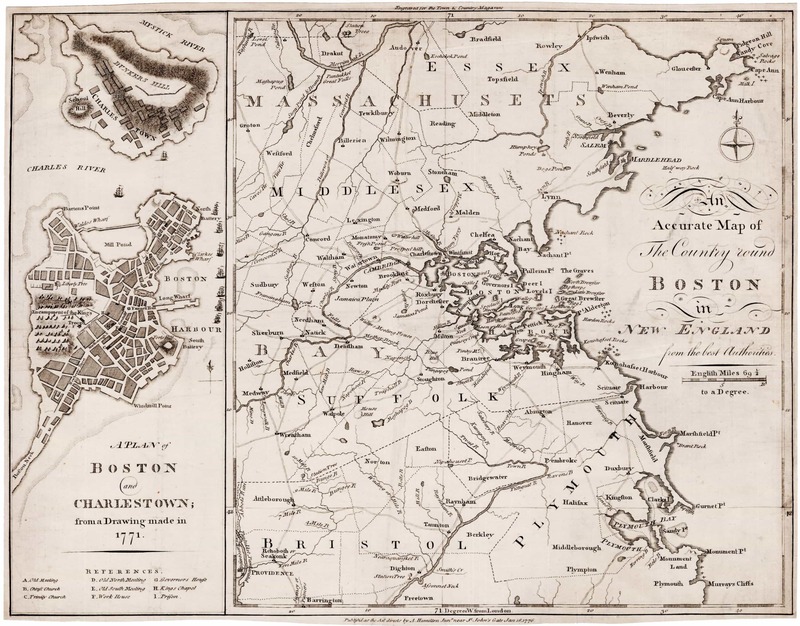 An uncommon plan of Boston and Charlestown, side-by-side with a map of the greater Boston area, published during the Revolution to inform British readers hungry for news of the Colonies. This image was published in the January 1776 Town and Country Magazine, while the British were still besieged in the town. Two months later the Americans would emplace cannon on Dorchester Heights, giving them command of the town and its water approaches. The British were forced to evacuate, being allowed to do so unmolested in return for not setting Boston afire. 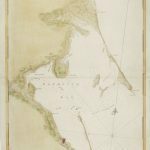 The plan of Boston and Charlestown is striking—at the time, Boston was essentially an island linked to the mainland via a narrow causeway. Shown are the streets and some street names; as well as landmarks such as the Common (with the Liberty Tree and the “encampment of the King’s troops”), Long Wharf, and numerous fortifications. To the North is a rather schematic representation of the Charlestown Peninsula, showing Charlestown crowded with buildings though it had in fact been devastated by bombardment during the June 1775 Battle of Bunker Hill. Complementing the city plan is a map of the greater Boston area based on Jefferys’ Map of the Most Inhabited Part of New England. It depicts the region from roughly the Merrimack River in the North, southward to Plymouth and Providence, and westward as far as Holliston, Sudbury &c. Roads are shown, as are towns and town boundaries. This map would have provided British readers with a geographical context for understanding events in and around Boston, which was the main theatre of action during the first year of the Revolution. With regard to scale, amount of information and quality of engraving, this is the finest geographic depiction of Revolutionary-era Boston issued in a contemporary periodical. Boston Engineering Department, List of Maps of Boston, p. 74; Jolly, Maps of America in Periodicals before 1800, #302; Nebenzahl, Bibliography of Printed Battle Plans, #14 and 14a; Winsor, Narrative and Critical History, p. 212.